Home of the infamous and rare Chilli Plant, known as Chilli Willy. "Chilli Willy" Peppers grow naturally phallic shaped and taste great too! 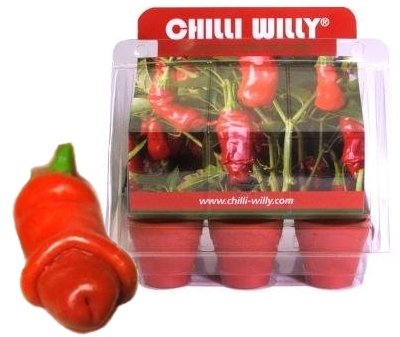 Chilli-Willy.com was created to showcase one of the most outrageous chilli plants of all time and to serve up some serious heat in the chilli and spicy food world, through our various branded products and edibles. The name “Chilli Willy” lovingly refers to a rare species of chilli plant that naturally grows amusingly shaped chillies that are fully edible and taste incredible. A unique combination that is at the core of the company and evident in all of our products. Chilli Willy is making an impact in the food and gifts industry worldwide. See our Press & Media page for more. Our chilli products are designed to shock, thrill and amaze you and your friends, your family and anyone else’s taste buds! All our products are based around our core beliefs that food should bring people together, to try new things and to explore the incredible world of chillies. Chilli Willy is a social food brand focused on delivering some of the World’s most talked about, tasty and naturally addictive food and gift products that are guaranteed to make people smile. This is a great gift for those with a sense of humour! They come in a nicely presented pack with 6 little red pots and soil to plant them in – which I was pretty impressed with. I left them on the kitchen table when I first got them (just in the pack) and everyone who visited had a bit of a giggle! Got this as a present for a friend who has recently got into growing her own vegetables. She had asked for some packets of seeds so this is what I got her. We all had a great laugh when she opened it and I can’t wait to see them grow. I really love this. Lots of fun and a great kit that’s easy to use for complete amateurs like me. Planted them a few months ago and They’re still going strong. Can’t wait to eat the Chillies. Founded in 2008, our aim is not only to spread the laughter and entertainment of this amazing plant with our Award-Winning “Grow your own” range, but also share our core vision of combining great taste with great entertainment. Another aim is to highlight the amazing health benefits of eating chillies, the ability that chillies have to add new flavours to your food depending on what variety you choose, to burn extra calories, promote well-being and to even act as Aphrodisiacs!